Q: Am I going to be successful in my career / business path? This is one of those times where being a slave to ritual can lead a reading a little sideways. This is a time for Iistening to intuition as much as strictly looking at cards alone. When I first read your e-mail and pulled the cards I had a strong impression of “rough start but yes” One ace is usually read as “maybe, leaning no” BUT that isn’t the energy here at all. The reason I’m speech-ifying a simple “yes” is I worry the bumpy start might descourage you. 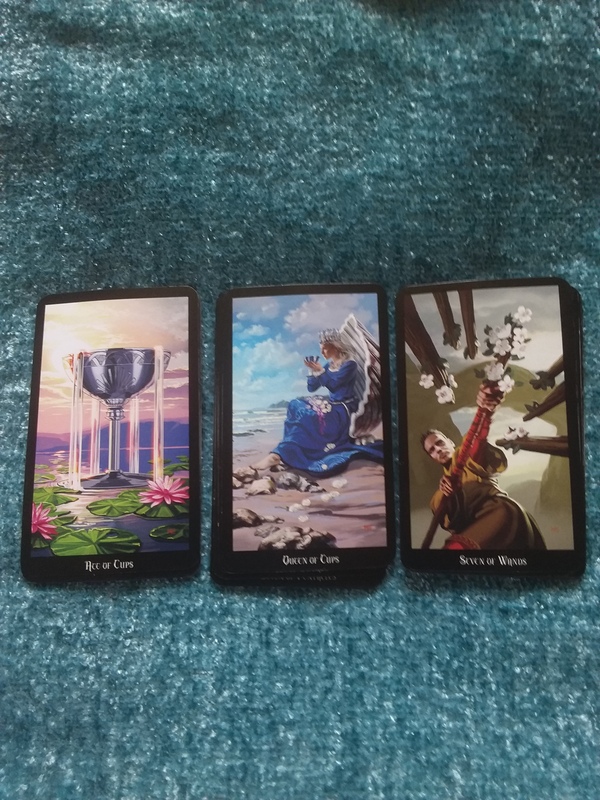 Pointing out the crescendo in these cards, I hope, will give you a little encouragement if you ever need it. It’s all pretty simple, really. The seven of wands is about your real-world, no-intuition-needed situation. A potty break and a hot cup of tea are going to be challenge enough much less starting and growing a career / business. But when the time is right, pieces will fall into place. When the time is right, you’ll know. The Queen of Cups is inner knowing. It is a reminder you will know when the transition times are right. Trust your gut. When you know in your bones it is the right path, then it is. Don’t get attached to expectations or an old career path. There is nothing wrong with adapting your plans or changing your definition of success in order to follow that bones-level Wisdom. The key is the ace. The aces are connected to yes energy in this yes/no layout. If you look at this the a pathway reading instead, then the pattern builds past to future, from challenge to success. Ace of cups is creativity and abundance. In my mind’s eye I definetly see you doing the crystal / holistic / oils work we’ve talked about before, especially as an online shop as well as (or maybe instead of) in-person work. And there the energy steps back. Good Luck with everything! Keep us posted!